So, what is Lewis theory? and the resulting patterns are complicated & exquisite. As chemists we try to understand the dance. Our physicist friends attempt to understand the music. Lewis theory is the study of the patterns that atoms display when they bond and react with each other. 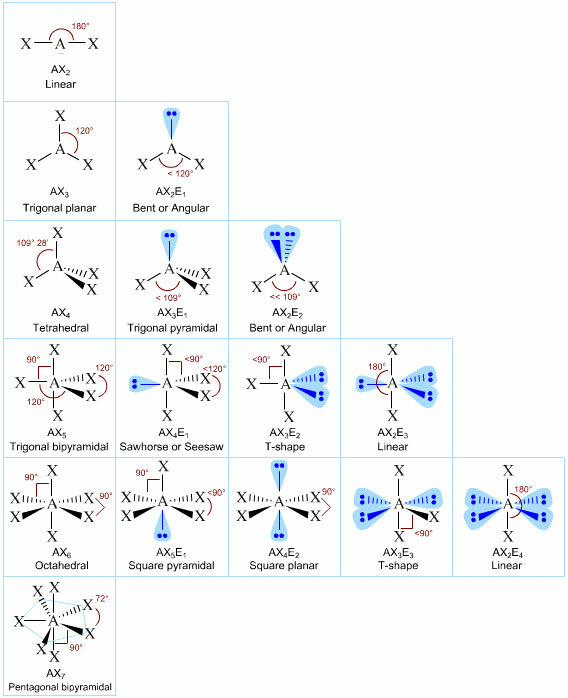 The Lewis approach to understanding chemical structure and bonding is to look at many chemical systems, to study the patterns, count the electrons in the various patterns and to devise simple rules associated with stable/unstable atomic, molecular and ionic electronic configurations. 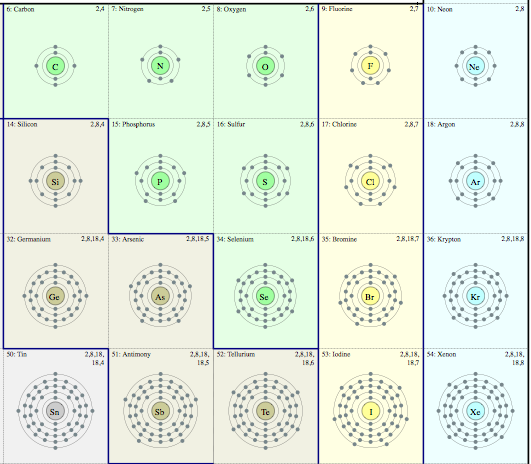 Atoms and atomic ions show particular stability when they have a full outer or valence shell of electrons and are isoelectronic with He, Ne, Ar, Kr & Xe: Magic numbers 2, 10, 18, 36, 54. 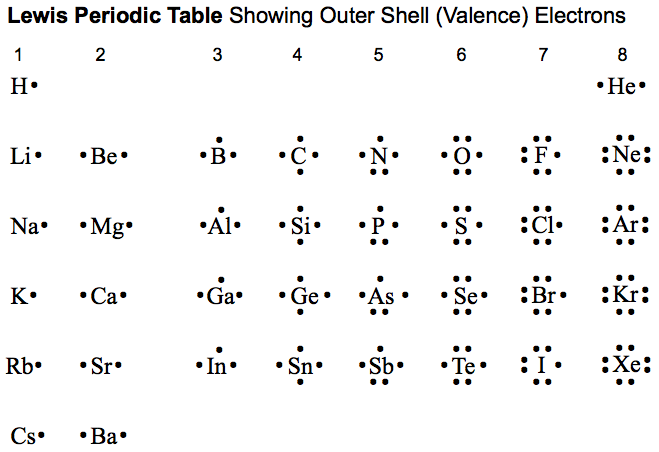 Atoms have a shell electronic structure: Magic numbers 2, 8, 8, 18, 18. Sodium metal reacts to give the sodium ion, Na+, a species that has a full octet of electrons in its valence shell. Magic number 8. A covalent bond consist of a shared pair electrons: Magic number 2. Atoms have valency, the number of chemical bonds formed by an element, which is the number of electrons in the valence shell divided by 2: Magic numbers 0 to 8. Ammonia, H3N:, has a lone pair of electrons in its valence shell: Magic number 2. Ethene, H2C=CH2, has a double covalent bond: Magic numbers (2 + 2)/2 = 2. Nitrogen, N2, N≡N, has a triple covalent bond: Magic numbers (2 + 2 + 2)/2 = 3. The methyl radical, H3C•, has a single unpaired electron in its valence shell: Magic number 1. Lewis bases (proton abstractors & nucleophiles) react via an electron pair: Magic number 2. Electrophiles, Lewis acids, accept a a pair of electron in order to fill their octet: Magic numbers 2 + 6 = 8. Oxidation involves loss of electrons, reduction involves gain of electrons. Every redox reaction involves concurrent oxidation and reduction: Magic number 0 (overall). Curly arrows represent the movement of an electron pair: Magic number 2. Ammonia, NH3, and phosphine, PH3, are isoelectronic in that they have the same Lewis structure. Both have three covalent bonds and a lone pair of electrons: Magic numbers 2 & 8. Aromaticity in benzene is associated with the species having 4n+2 π-electrons. Magic number 6. Naphthalene is also aromatic: Magic number 10. 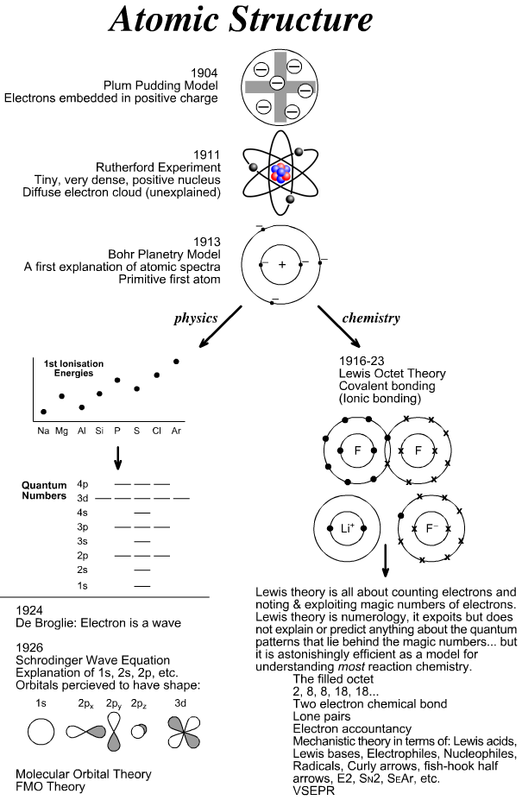 Lewis theory is electron accountancy: look for the patterns and count the electrons. Lewis theory is also highly eclectic in that it greedily begs/borrows/steals/assimilates numbers from deeper, predictive theories and incorporates them into itself, as we shall see. Ernest Rutherford famously said: "Physics is the only real science. The rest are just stamp collecting." Imagine an alien culture trying to understand planet Earth using only a large collection of postage stamps. The aliens would see all sorts of patterns and would be able to deduce the existence of: countries, national currencies, pricing strategies, differential exchange rates, inflation, the existence of heads of state, what stamps are used for, etc., and – importantly – they would be able to make predictions about missing stamps. But the aliens would be able to infer little about the biology of life on our planet by only studying stamps, although there would be hints in the data: various creatures & plants, males & females, etc. 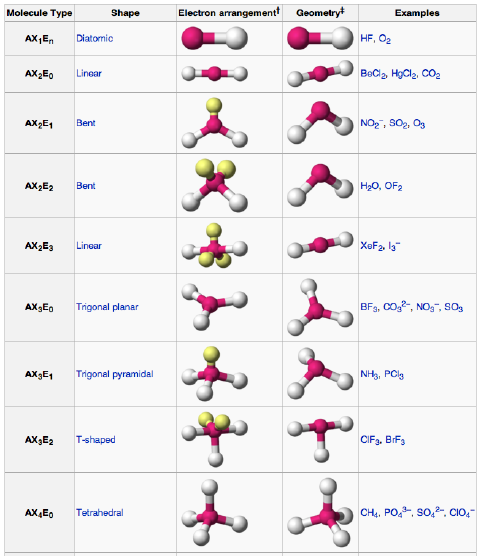 So it is with atoms, ions, molecules, molecular ions, materials, etc. As chemists we see many patterns in chemical structure and reactivity, and we try to draw conclusions and make predictions using these patterns: This is Lewis theory. But this Lewis approach is not complete and it only gives hints about the underlying quantum mechanics, a world observed through spectroscopy and mathematics. 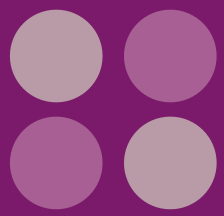 You may feel that the right hand side "does not fit the pattern" of Diagram-1 and so is an anomaly. So, is it an anomaly? 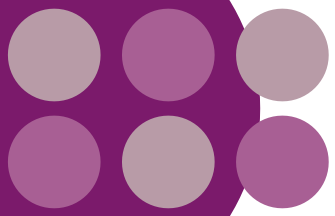 When viewing the larger scale the overall pattern emerges and everything becomes clear. Of course, the Digital Flowers pattern is trivial, whereas the interactions of electrons and positive nuclei are astonishingly subtle. This situation is exactly like learning about chemical structure and reactivity using Lewis theory. First we learn about the 'Lewis octet', and we come to believe that the pattern of chemistry can be explained in terms of the very useful Lewis octet model. Then we encounter phosphorous pentachloride, PCl5, and discover that it has 10 electrons in its valence shell. Is PCl5 an anomaly? No! The fact is that the pattern generated through the Lewis octet model is just too simple. As we zoom out and look at more chemical structure and reactivity examples we see that the pattern is more complicated that indicated by the Lewis octet magic number 8. While these observations can be explained after the fact, they were not predicted beforehand. We do not have the mathematical tools to do predict the nature of the quantum patterns with absolute precision. The chemist's approach to understanding structure and reactivity is to count the electrons and take note of the patterns. This is Lewis theory. 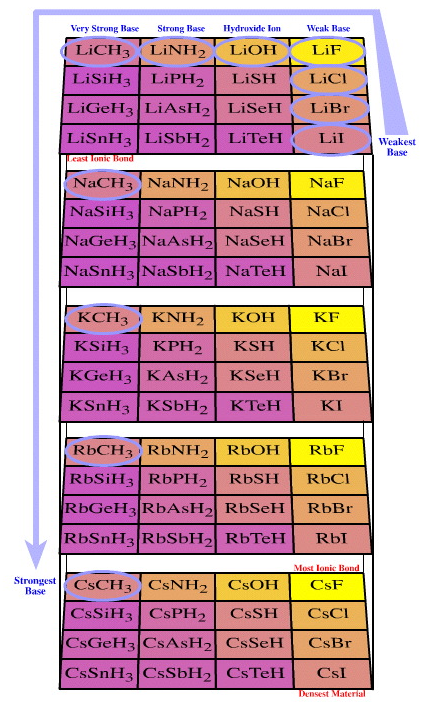 There following some diagrams showing chemistry patterns. Do not think about these as chemistry systems, yet, but just as patterns. 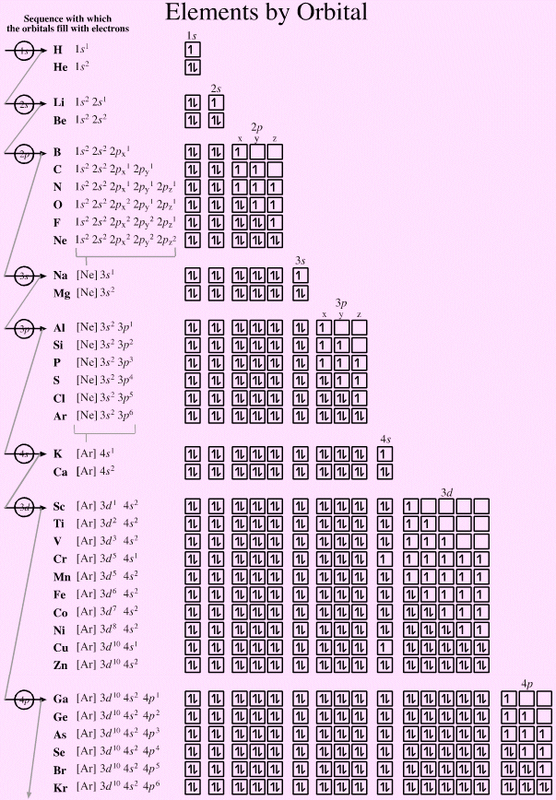 The conventional representation of the periodic table can be regarded as a mapping applied to the Janet formulation. The pattern is clearer in the Janet periodic table. 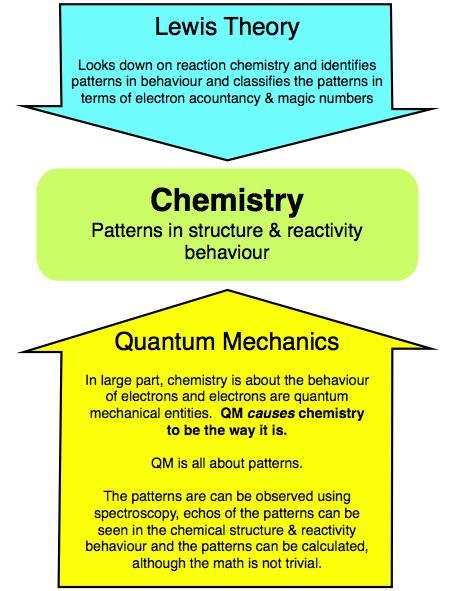 As chemists we attempt to 'explain' many of these patterns in terms of electron accountancy and magic numbers. The crucial time for our understand chemical structure & bonding occurred in the busy chemistry laboratories at UC Berkeley under the leadership of G. N. Lewis in the early years of the 20th century. Lewis and colleagues were actively debating the new ideas about atomic structure, particularly the Rutherford & Bohr atoms and postulated how they might give rise to models of chemical structure, bonding & reactivity. Indeed, the Lewis model uses ideas directly from the Bohr atom. The Rutherford atom shows electrons whizzing about the nucleus, but to the trained eye, there is no structure to the whizzing. Introduced by Niels Bohr in 1913, the Bohr model is a quantum physics modification of the Rutherford model and is sometimes referred to the Rutherford–Bohr model. (Bohr was Rutherford's student at the time.) The model's key success lay in explaining (correlating with) the Rydberg formula for the spectral emission lines of atomic hydrogen. The physics fork was initiated and developed by Bohr, Pauli, Sommerfield and others. Research involved studying atomic spectroscopy and this lead to the discovery of the four quantum numbers – principal, azimuthal, magnetic & spin – and their selection rules. More advanced models of chemical structure, bonding & reactivity are based upon the Schrödinger equation in which the electron is treated as a resonant standing wave. This has developed into molecular orbital theory and the discipline of computational chemistry. 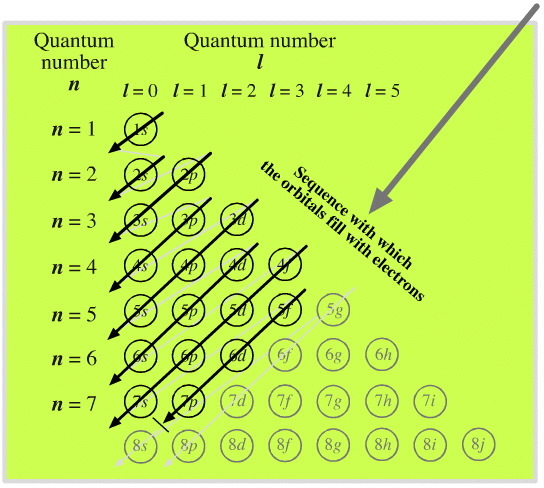 Note: quantum numbers and their selection rules are not 'magic' numbers. The quantum numbers represent deep symmetries that are entirely self consistent across all quantum mechanics. The chemistry fork started when Lewis published his first ideas about the patterns he saw in chemical bonding and reactivity in 1916, and later in a more advanced form in 1923. Lewis realised that electrons could be counted and that there were patterns associated with structure, bonding and reactivity behaviour. These early ideas have been extensively developed and are now taught to chemistry students the world over. This is Lewis theory. A word should be said about the philosophical nature of theory as it is possible to take two extreme positions: realist or anti-realist. The realist believes that theories are a true, real and actual representation of reality in that theories describe what the physical world is actually like. To the anti-realist theories are simply a representation or description of reality. An instrumentalist is an anti-realist who simply uses the toolbox of conceptual and mathematical techniques to describe and understand the physical world. Even though theories are all we have, they should be used but not believed. Do not inhale. This is crucial, because when tested to the extreme all chemical theories are found wanting, a situation that always confuses the realist. The cynical anti-realist knows model breakdown is inevitable because theories are not real. For example, most of the structure and bonding ideas in textbooks, and this web book is no exception, are expressed in terms of Lewis/VSEPR ideas. Lewis theory is a fantastic model and it works nearly all the time. In fact, Lewis theory is so good that most chemists can get away with assuming that it is true, that it is real. If just one white crow is found, for what ever reason, then the black crow theory cannot be a true and full description of the world. It cannot be real. Black crow theory (BCT) may remain a useful model that works most of the time, but it cannot be true in a philosophical sense. Indeed, this is the representation commonly used in beginning and high school level textbooks. But, oxygen, O2, presents to the experimentalist as a blue, paramagnetic, diradical species, O-O, able to exist in singlet and triplet forms. The physical and chemical properties of O2 are NOT explained by Lewis logic. Diatomic oxygen is a white crow. The empirical (experiential) observations associated with O2 can be explained in terms of molecular orbital theory, see elsewhere in this webbook. This does not totally invalidate Lewis theory, but it does warn us that the Lewis model is fallible and so the model cannot be "a true and real representation of the physical world", in the realist sense. Question: Is O2 an anomaly? No, O2 is not an anomaly. The diradical structure is inevitable with respect to the patterns of the molecular orbitals, as discussed here. The quantum mechanical patterns of molecular structure are more subtle than the magic numbers of Lewis theory. Question: Is molecular orbital theory a chemical theory of everything? Is MO theory real? No, molecular orbital theory is not real. While MO theory gives a more accurate and capable description of diatomic oxygen O2 than Lewis theory, MO theory cannot explain why chiral (optically active) molecules like glucose rotate plane polarised light. This phenomenon requires explanation in terms of quantum electrodynamics, QED. At the top of this page it was stated that "Lewis theory is highly eclectic in that it greedily begs/borrows/steals/assimilates numbers from deeper, predictive theories and incorporates them into itself". Indeed, modern Lewis theory is the set of assimilated magic numbers & electron accountancy rules used by most chemists to explain chemical structure and reactivity. The idea that electrons are point like negative charges that exist in atomic shells is the quintessential Lewis approach. The full shell numbers: 2, 8, 8, 18, 18 are determined by experiment. Students must soon realise that 8 is not the only magic number because helium, He, and the lithium cation, Li+, have two electrons in their full shell, magic number 2. So, there are two Lewis magic numbers 2 and 8. This is the first hint that matters are a little more involved than first indicated. Question: Is the magic number 2 an anomaly? No, it tells us that the Lewis octet rule, although useful, is not subtle enough to describe the entire pattern. The patterns we see are an echo of the underlying quantum mechanical patterns. A covalent bond is a form of chemical bonding characterised by the sharing of pairs of electrons between atoms. The Lewis octet rule – with its magic numbers of 2 & 8 – can be used to explain much main group and organic chemistry. 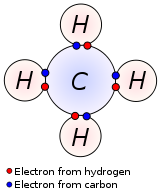 In the diagram of methane, CH4, above, the carbon atom has 8 electrons in its valence shell and each hydrogen has 2 electrons in its valence shell. However, at university entrance level students will have come across two phosphorous chlorides, phosphorus trichloride, PCl3, and phosphorous pentachloride, PCl5. There is no issue with PCl3 as it has a full octet, magic number 8 and is isoelectronic with ammonia, NH3. Phosphorous pentachloride, PCl5, has 10 electrons in its valence shell, and this represents a NEW Lewis magic number, 10. The structure and geometry/shape of phosphorous pentachloride, PCl5, is usually covered with reference to valence shell electron pair repulsion (VSEPR), as discussed on the next page of this webbook. From Wikipedia: "Two or more molecular entities (atoms, molecules, ions) are described as being isoelectronic with each other if they have the same number of valence electrons and the same structure (number and connectivity of atoms), regardless of the nature of the elements involved." The cations K+, Ca2+, and Sc3+, the anions Cl−, S2−, and P3− are all isoelectronic with the Ar atom. The diatomics: CO, N2 & NO+ are isoelectronic because each have 2 nuclei and 10 valence electrons (4 + 6, 5 + 5, and 5 + 5, respectively). Isoelectronic structures represent islands of stability in "chemistry structure space", where chemistry structure space represents the set of all conceivable structures, possible and impossible. Lewis theory does not explain how or why the various sets of isoelectronic structures are stable, but it takes note of the patterns of stability. From Wikipedia: "Valence shell electron pair repulsion (VSEPR) is a model used to predict the shape of individual molecules based upon the extent of electron-pair electrostatic repulsion." The VSEPR technique is pure Lewis theory. Like Lewis theory it employs point-like electrons, but in pairs. VSEPR predicts that the electron pairs will repel each other, and that non-bonded lone-pairs will repel slightly more than bonded pairs. The net effect to is maximise the distance between electron pairs and so generate the most spherically symmetric geometry about the atomic centre. VSEPR is an astonishingly good "back of an envelope" method for making predictions about the shapes of small molecules and molecular ions. VSEPR introduces to Lewis theory the idea that molecular systems, atoms-with-ligands, pair the electrons in the atoms valence shell and maximise the spherical symmetry about the atomic centre . 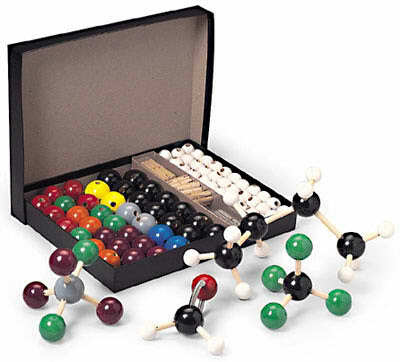 Lewis theory and the VSEPR technique are so successful that it is possible to build physical models of molecular structures. It is astonishing how well these physical 'balls & sticks" achieve their objective their objective or modelling molecular and network covalent materials. Borane, BH3, has only six electrons in its valence shell, but it wants eight "to fill its octet" and it is an electron pair acceptor. Ammonia, NH3, has a full octet, but two of the electrons are present as a reactive lone-pair. Borane reacts with ammonia to form a Lewis acid/base complex in which both the boron and the nitrogen atoms now have a full octets. No explanation is given within Lewis theory as to why the magic number 8 should be so important. 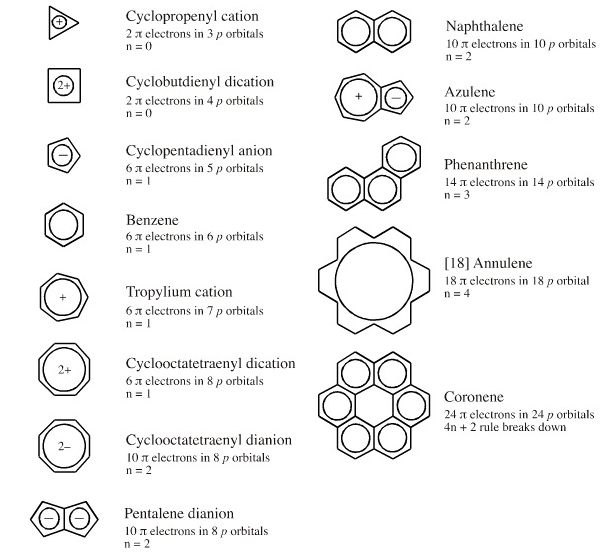 Some unsaturated organic ring systems, such as benzene, C6H6, are unexpectedly stable and are said to be aromatic. A quantum mechanical basis for aromaticity, the Hückel method, was first worked out by physical chemist Erich Hückel in 1931. In 1951 von Doering succinctly reduced the Hückel analysis to the "4n + 2 rule". Aromaticity is associated a cyclic array of adjacent p-orbitals containing 4n+2 π-electrons, where n is zero or any positive integer. Aromaticity is associated with cationic, anionic and heterocyclic π-systems, as well as neutral hydrocarbon structures like benzene and naphthalene. Aromaticity can be identified by a ring current and associated down-field chemical shift in the proton NMR spectrum. (Aromatic compounds have a chemical shift of 7-8 in the proton spectrum). Pyrene and coronene are both aromatic by NMR ring current AND by the Hückel method, but they both fail von Doering 4n + 2 rule. This tells us that although it is a useful method, the 4n + 2 rule does not have the subtly of quantum mechanics. The 4n + 2 rule is pure Lewis theory. Lewis theory is used to explain most types of reaction mechanisms, including Lewis acid/base, redox reactions, radical, diradical and photochemical reactions. The toluene is assumed to have a sigma-skeleton that can be described with VSEPR. The benzene π-system is added to the sigma-skeleton. The curly arrows are showing the movement of pairs of electrons, pure Lewis. The Wheland intermediate is deemed to be non-aromatic because it does not possess the magic number six π-electrons. Quantum mechanics and Lewis theory are both concerned with patterns. However, quantum mechanics actively causes the patterns whereas Lewis theory is passive and it only reports on patterns that are observed through experiment. We observe patterns of structure & reactivity behaviour through experiment. Lewis theory looks down on the empirical evidence, identifies patterns in behaviour and classifies the patterns in terms of electron accountancy& magic numbers. Lewis theory gives no explanation for the patterns. Echoes of the underlying quantum mechanics can be seen in the chemical structure & reactivity behaviour patterns. The patterns can be calculated, although the mathematics is not trivial. Atoms and their electrons behave according to the rules of quantum mechanics. This quantum world projects onto our physical world which we observe as being constructed from matter. As chemical scientists we observe matter and look for patterns in structure and reaction behaviour. Even though quantum mechanics is all about patterns, when we observe matter we see 'daughter patterns' that show only echoes of the 'parent' quantum mechanical patterns. At one level Lewis theory is utter tosh (complete rubbish). Electrons are not point charges. The covalent bond does not have a shared pair of electrons as explained by Lewis theory. Ammonia, H3N:, does not have a 'lone pair of electrons'. VSEPR is not a theory, but just a neat trick... a very, very, very useful neat trick! Yet, Lewis theory and the associated VSEPR method work so well that it is actually rather difficult to falsify the approach. It is hard to think of counter examples where the model breaks down. As discussed above, oxygen, O2, is a paramagnetic diradical. But O2 is only a diatomic molecule and does not have an ∠ABC bond angle and so it is not appropriate to use VSEPR analysis. In hydrogen peroxide, H-O-O-H, the two oxygen atoms behave as typical Lewis/VSEPR atomic centres. Carbon monoxide, another diatomic, 'looks all wrong' using the Lewis approach unless it is constructed as –C≡O+. Carbenes, such as methylene, CH2, do not fit into the Lewis scheme very well. Carbenes are diradicals. The bond angle in hydrogen sulfide, H2S, is 92.2° is much less than the bond and in water, H2O, which is 104.5°. This is not explained by VSEPR. There are many examples like this: the nitrogen in an amide is planar and not trigonal pyramidal; SF4 consists of an equilibrium of two interconverting see-saw forms; ammonia and phosphine, NH3 and PH3 have rather different bond angles; etc. But these examples are explainable perturbations rather than counter examples that disprove the approach. The Lewis structure of nitrogen dioxide, NO2, is not easy to construct in an unambiguous way, as discussed by Dan Berger. Nitrogen dioxide is a radical species with an unshared electron. In a related way, it is difficult to draw out the Lewis structure of a nitro function in nitrobenzene in an unambiguous manner. Copper(II) ions, Cu2+, such as [Cu(H2O)6]2+ exhibit Jahn-Teller distortion, a subtle quantum mechanical effect. Lewis theory, in the form of the Drude approach, is not good at modelling metals. Crucially, the Lewis model does NOT predict the aromatic stabilisation of benzene. However, the Lewis approach happily assimilates von Doering's – useful but not perfect – 4n + 2 rule. Interestingly, once aromaticity is incorporated into the Lewis methodology, VSEPR can be used to predict benzene's 120° bond angles. There are Jahn-Teller distortions in organic chemistry, for example cyclobutadiene, but they are rare and end up giving the same result as predicted by VSEPR! The cyclobutdienyl dication is aromatic, both by experiment and by the 4n+2 rule. It has a cyclic array of 4 p-orbitals containing 2 π-electrons so n = 0. Cyclobutadiene, according to the Hückel method "should" be a perfectly square diradical, but this a high energy state. As shown by Jahn and Teller, the actual molecule will not have an electronically degenerate ground state but will instead end up with a distorted geometry in which the degeneracy is removed and one molecular orbital (the lower energy one) becomes the unique HOMO. For cyclobutadiene that means distorting to a rectangle with two short bonds, where the π-bonds are found, and two long bonds. The net result is to give the structure as predicted by Lewis/VSEPR. Many thanks to members of the ChemEd list for examples, discussions & clarifications. There is no point in using any type of Lewis theory to help explain the atomic spectra. These patterns are explained with exquisite precision using quantum mechanics.